Caring for aging parents is challenging, even for those who are well-equipped for the task. The workload is heavy, and it can grind you down if you don’t take care of yourself. In elder care, there is a saying: “Secure your own oxygen mask before helping someone else.” If you’ve ever been on an airplane, you’ve heard this bit of advice before. Before taking off, the flight attendant demonstrates the various safety procedures of the airplane—how to fasten the seatbelt, where the exits are on the plane, how to put on a floatation device. If the cabin loses pressure, the flight attendant says over the intercom, oxygen masks will drop from the overhead bin. Caring for aging parents can feel like that, like a depressurized airplane that’s losing altitude, and if you want to make sure that your loved ones are taken care of, you have to take care of yourself. You have to put on your oxygen mask first. Here are six tips that will help you do that. When caring for aging parents, solitude can be rare. Depending on your parents’ condition, you might be able to grab a few minutes here and there, but most of the time they need your help. Even people who love each other can start to wear on one another in such close quarters. A weekend away—or longer if you really need to decompress—is a good way to find your bearings again. The bottom line is that your health needs to come first. Caring for aging parents is impossible if your physical or mental health is compromised. Even if you’re not feeling ill, it’s important to maintain a relationship with your doctor. Make an appointment to discuss strategies to stay healthy, such as maintaining a proper diet and exercise regimen. For most people, going it alone doesn’t work. Ask your family and friends for help. There are a lot of tasks that don’t require direct caregiving. Delegate these when you can. Things like grocery shopping, making medical appointments, paying bills, and dealing with insurance don’t all have to fall to you. Caring for aging parents can be isolating. You might feel guilty taking time to just catch up with friends because there is so much to do, but it is necessary. Your loved one probably needs some time with a new face, too. Caregiving is a juggling act. Keeping all your obligations in the air is difficult enough as it is without taking on more responsibility. Just be honest. If someone asks you for a favor and you feel that you can’t help without risking your mental health, just tell them you can’t. Explain to them that you have too much going on, and whatever you do, don’t feel guilty. Whether you just need to take a long weekend to yourself or you need someone to watch mom or dad while you go to dinner with your friends, Granny NANNIES is here to help. 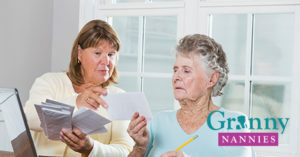 Want to learn more about the care services from Granny Nannies Miami? Call us today at (305) 591-1818. We offer a free in-home care consultation.